This green smoothie features one of my favorite green superfood powders, Ormus Supergreens. I recommend green superfood powders for one or more of the following reasons: getting your daily allowance of veggies is a challenge, traditional green smoothies (blended green leafy vegetables) aren’t your thing, you want to incorporate an extremely nutrient dense green superfood into your diet. For a lot of people using green superfood powders is sort of graduation to the next level of smoothie making, but in reality they can be a great starter ingredient if you want your smoothies loaded with nutrition, without much effort, right off the bat. 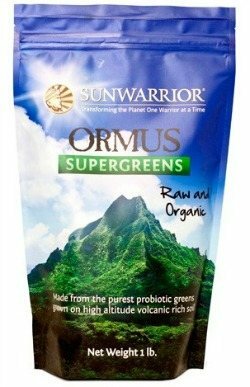 Why am I so high on Sun Warrior’s Ormus Supergreens? The product is formulated from organic grasses grown in an ancient sea bed located in a volcanic region of Arizona and Utah. The mineral-rich soil these greens are grown in is loaded with platinum, silver, gold and ormus trace minerals. The ingredients include probiotic cultured greens, alfalfa, barely, wheat, and oat grass, and powdered down spinach, parsley, peppermint and stevia. The peppermint and stevia result in a minty taste, with a hint of sweetness. I like the flavor it imbues my smoothies with – it’s definitely not something you need to “hide” the taste of. I tend to view superfood powders, green or not, as a replacement for a daily multivitamin. If you’re interested in learning more about or purchasing Ormus Supergreens, click here. Other top notch green superfood powders I endorse are Boku and Vitamineral Green. Adding a green superfood supplement to your already healthy green smoothie results in a truly “super” green smoothie. If you don’t have a green superfood powder on hand, simply omit from the recipe. Enjoy! Load the ingredients into your high-speed blender and blend for around 30-45 seconds or until your desired consistency is reached. Let me know what you think of this Ormus Supergreens smoothie by leaving a comment below. Happy Blending! I was curious on why use spinach if also using a super green powder? You can never have too much green (power) in your smoothies, Ron :) The green superfood powders are my insurance when I don’t have fresh greens. When adding a super green to smoothies I typically use the recommended amount. However, you can always use more or less depending on your preferences (some are strong tasting) and the smoothie you’re making. I find the super greens go well in most recipes. I’d start with 1/2 teaspoon in the tropical turmeric smoothie and gradually increase the amount until you reach the recommended amount of 2.5 teaspoons, or a lesser amount that still results in a tasty smoothie. Play with super greens to find your sweet spot. Ryan, thank you. I guess my kids are trying top keep me going at 80 now. I just started with healthy smoothies in Jan and enjoying them. If I just use the suggested amount would it be better to not add the spinach or kale as long as I get the flavor I want with the supergreens and not add both? I don’t know if too much greens is also not a good idea. By the way, I really think I’ve been helped with the turmeric, ginger smoothies by reducing my arthritic pain, along with some exercises. I’m trying to keep you going too :) It’s hard to over do it on the greens in a smoothie. Use both, unless the resulting smoothie is too bitter, then just use the super greens. Great to hear the turmeric and ginger (wonderful herbs) have helped ease your arthritic pain. Keep moving!